Tom Gregorio moves as rookie Marty Musella studies the rules. Only the L2 Design Group edition of was played in this year's event. 20 participants played a total of 27 games. For the first time, Allied wins exceeded German wins, 14 vs 13. This further attests to the play balance of the tournament scenarios. Players were free to choose any scenario, with the default game being the 8-turn tournament scenario. Marty Musella won the rookie award by defeating a number of veterans. Marty was only stopped in the fourth round by the ultimate winner of this year's tournament. Hats off to Marty. The real wild card proved to be Jeff Hacker. Jeff lost in the Mulligan, but vowed to make a comeback in the first round by playing the Yanks. He quickly won with this side in two successive games, and was only stopped a few rounds later by the rookie honoree, Marty. The final round pitted two past champs, Tom Gregorio and Randy Heller. Sides were determined by a toss of the die. The opening guns saw only modest German gains. Randy's German forces were stymied in front of Clervaux by successive Engagements on 3-1 attacks against the Bloody 110th. An error in placement by Randy prevented the Germans from crossing the Our River until later in the second day. 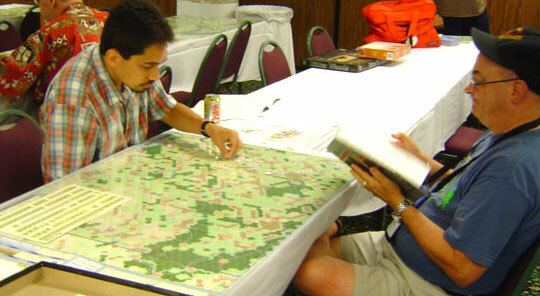 By turn 17 PM, the Yanks appeared to have a lock on the central and southern sections of the game map. However, a near fatal mistake in the vicinity of St. Vith provided a high odds attack on a defending artillery unit, which allowed for a generous advance after combat and unhinging of the Allied defense. A couple of key 6-5-4 units were trapped in the North by judicious sequencing of attacks. By mid-game the Allies were becoming unit poor. A crafty reserve ploy resulted in a regiment of 116th Panzer moving behind Bastogne to prevent any building of a fortification in the historical town. Tom banked on a high odds counterattack to put pay to the intruder, but rolled a 6 on the die. With the die roll modifier benefiting the Germans, due to a higher Endurance Rating, only a one step loss was incurred. Tom recognized that he could not recover from his awkward defense position, contributed to by high Allied losses, and conceded the game prior to the arrival of the German 19 AM reinforcements. This left the game's designer the winner of the tournament, marking his second DBW WBC first place wood.